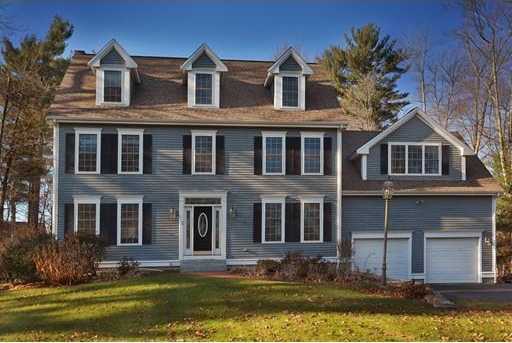 This stunning 5 Bedroom, 3.5 Bath Center Entrance Colonial with over 3500SF will welcome you with open arms. The warmth and coziness of the colors along with unsurpassed detail and craftsmanship creates a mood for both entertaining as well as the serenity you desire. Situated on an elevated knoll with stone walls and mature landscaping, and on one of Georgetown’s most desirable streets, this lovingly cared for home sits high and proud among its peers in both quality and stature while featuring: Hardwood Floors, spacious Granite Kitchen with tile floor, high end appliances and center island with pendant lighting, a front to back Family Room with custom built-ins and lighted mantel over fireplace, a Formal Dining Room, 4 beautifully sized bedrooms plus Master BR with Jacuzzi Bath and shower along with double sinks in BOTH Master as well as the second floor Bath. Third floor is perfect for an occasional guest or extended stay with its own bedroom, ¾ bath and large sitting/living room.